The Department of Fisheries and Oceans, Canada, has the role of leadership in managing the impact of human interactions on Canada's pacific coast, which runs the length of the shoreline of British Columbia. The pacific coast covers an areial distance of 965 kilometres, from the capital city of Victoria on the Strait of Juan de Fuca, to Stewart, British Columbia, adjacet to the border of Alaska. In British Columbia, there are some 6,500 islands; 37,000 kilometres of shoreline; and approximately 450,000 square kilometres of ocean. Fisheries and Oceans Canada (DFO), through the Pacific Oceans Program, is mandated wiith the task of protecting the marine ecosystem and with maintaining a prosperous, marine economy. To these ends, the DFO is guided in Canada by the Oceans Act, the Fisheries Act, the Species at Risk Act and Canada's Oceans Strategy. Sustainable development and use of Canada's marine resources to support economic growth and prosperity while ensuring a viable future. Integreated management by bringing ocean users together to manage and conserve Canada's marine resources. A precautionary approach by 'erring on the side of caution' to protect resources and preserve the marine environment. (Though this a stated commitment, action is often delayed, requiring intervention of the courts). The DFO works with other federal departments, provincial agencies, Aboriginal peoples and other stakeholders who share responsibility and commitment in monitoring ocean issues in the pacific coast region. The Species At Risk Act is paramount in supporting Canada's conservation efforts in British Columbia's marine and inland waterways. Considered endangered are: North Pacific Right Whales; Sei Whales; Blue Whales; and Leather-back Sea Turtles. Threatened species include: Fin Whales and Humpback Whales. Gray Whales and Harbour Porpoises are listed as species warranting Special Concern. Appearing on all three lists, is a prominent species living in British Columbia's coastal waters, Orcinus Orca, or the Killer Whale. The killer whale, Orcinus Orca, is a toothed whale, belonging to the dolphin family. Orcas are found in all oceans, from the Antarctic and Arctic, to regions in the tropics. They are marine mammals. They give birth to live young which are nursed with milk. 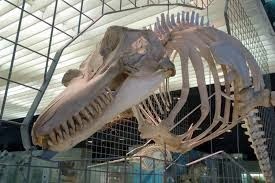 They are Cetaceans, of the sub-order of whales, Odontoceti, characterized with having teeth and a single blowhole. In spite of their common name, as dolphins (Delphinidae) killer whales are part of 36 different species including bottle-nose dolphins and pilot whales. The killer whale is the largest of the marine megafauna species in the dolphin family. When seen from a distance, young whales can be confused with other species, however adults are not easily confused with other such animals in the oceans. Adult Killer Whales are well-known for their distinctive black back, white chest and sides, and a white patch above and behind the eye. They have a heavy body with a large dorsal fin of up to six feet tall. Behind the fin, Orcas have a dark grey saddle patch across the back. Numerous opportunities for sightings of these animals exist along the BC coast, where resident and transient killer whales actively forage for prey such as salmon, seal, seabirds and other fishes in the Pacific Ocean. An apex predator, killer whales can live to between 50 and 80 years of age. Infant mortality in the species is high, with nearly half of all killer whales dying between birth and six months. This calculates to an adjusted, average lifespan of approximately 17 years for males and 29 years for females. Orcas calve only once every five years on average and mature for reproduction in their teens. With all of these factors combined, killer whale populations have a tendency towards a drastically low growth rate, making any threat to their survival, potentially, a problematic one. Orcas are highly social animals, living in pods that are often specific to a geographical region. Individuals in pods can be identified by their unique markings specific to individuals, much like the human fingerprint. They are considered cultural animals with a form of developed language, in that different populations have specific vocalization types. In addition, within the same individual populations, variable dialects are known to exist. Vocalization is taught and passed down the generations. These animals have complex social structures and are organized into a series of social units along maternal lines. A matriline consists of a group of closely related whales that are related to the matriarch, typically the oldest female. Individuals travel together at all times and remain within the matriline (with their mothers) for their entire lives. Offspring of both sexes stay with the mother as long as she is alive. Families in pods, travel as a group, identifying further social and cultural interaction in the pod. Photo identification processes have been employed for many years, providing data over life-spans which is used to monitor life models of individual whales in each pod. 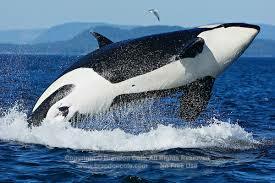 The Killer Whale is considered an iconic species off the British Columbia coast. The tourism industry benefits greatly by offering whale-watching tours that respects the habitat and life of these animals with thoughtful consideration, creating increased awareness of the animal's life for visitors. The industry creates opportunity for the general public to enjoy encounters with Orcas that ensures safety to the animal, while providing a public education experience that is, for all who visit, described as magical. 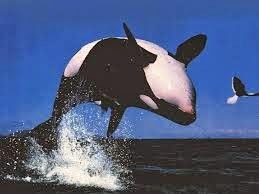 The Killer Whale holds major significance to the culture of British Columbia First Nations, as well. There are many stories of Orcas, across many individual groups of First Nations peoples. Illustrated by the case of 'Luna' some years ago, some tribes believe that chiefs, after death, can reincarnate into Orcas. Other legends tell tales of humans who drown at sea, later becoming killer whales. Orcas interacting with boats or swimming close to shore are seen, by First Nations peoples living along the BC coast, as really trying to communicate with their human families. With such value to so many, the killer whale deserves thoughtful, mindful consideration in developing conservation initiatives. The declining Northern and Southern resident killer whale populations is of paramount concern to many stakeholders now focusing on the survival of this species in Canada. The coastal waters of the northeastern Paciﬁc Ocean are home to three genetically distinct and socially isolated forms of killer whales, known as 'residents', 'transients; and 'off-shores'. Two of these populations are fish-feeding resident killer whales, known as the 'Northern and Southern Residents'. These two populations, whose feeding range does slightly overlap, are vocally, genetically and culturally distinct from each other. In 2009, the Committee on the Status of Endangered Wildlife in Canada (COSEWIC), confirmed their earlier (2001) designation of the Southern Residents as 'endangered' and the Northern Residents as 'threatened'. Both are listed in Canada's Species at Risk Act with these same designations. COSEWIC considers these two populations at risk, because of their small population size, low reproductive rate, and the existence of a variety of anthropogenic threats that have the potential to prevent recovery or to cause further declines. Anthropogenic threats are defined as those that are chiefly of environmental pollutants, originating in human activity. Principal among these anthropogenic threats are reductions in the availability or quality of prey, environmental contamination, and both physical and acoustic disturbance. Studies in the area have confirmed that prey availability for these residents, specifically, a decline in Chinook Salmon stocks, contributes greatly to the threat of the survival in this species. Internationally, the IUCN Red List of Endangered Species (2013) currently lists the status of Orcinus Orca as 'Data Deficient'. The profile for killer whales cites as threats to the species: Shipping lanes; Biological resource use; Human intrusion and disturbances; Invasive native species; Genetics; Pollution and Climate change. Issue of Concern: Declining Numbers in the Population of Northern and Southern Resident Killer Whales in British Columbia. As stated earlier, there are two resident populations of killer whales residing the northern and southern regions of British Columbia's coastal, marine waterways. Transient populations travel often along the coast. Offshore populations, the most understudied of all the groups, are rarely sited inshore. The Southern resident Orca population experienced declines of 3% per year between 1995 and 2001, and since then has shown little recovery. These animals are primarily found in the trans-boundary waters of Haro Strait, Boundary Pass, the eastern portion of the Juan de Fuca Strait, and southern portions of the Strait of Georgia. The Northeast pacific resident population, resides in waters off northern Vancouver Island and the mainland British Columbia coast, as far north as southeast Alaska. This population is small and has a low potential rate of increase. Between 1977 and 1997 their numbers did show an increase, however the population then experienced a decline of 7%. The resident killer whale population as of 2010 in British Columbia is only 300 individuals: 261 individuals in the northern community and 86 individuals in the southern community. A possible attributing cause in the decline in numbers of these two Orca populations, is correlated to declining salmon stocks, during the same period of decline for Orca in the pacific region. Chinook Salmon, it's been determined, are an important food source for resident killer whales on the B.C. Coast. Climate change and human activity are potential causes for the decling salmon supply to Orca's in the region. The team assessed the population dynamics of the Northern and Southern resident killer whales, using field study demographics, census data, and photo-identification of the killer whales in these two, distinct populations. They examined deaths and births in the individual groups, between 1973 and 2005 to establish averages in both categories. They also examined annual Chinook and Chum salmon numbers during the same period. Their findings showed a striking correspondence between changes in Chinook salmon abundance and mortality of northern and southern resident killer whales, suggesting that prey limitation was an important factor in population declines. John K.B. Ford is adjunct professor with the department of zoology at the University of British Columbia and is a research scientist with the Pacific Biological Station, Fisheries & Oceans Canada. Since the 1970's, Ford has worked in collaboration with a variety of students and colleagues in a long-term study of the identification, social organization, and life history of killer whales. His work involves studying the function of underwater acoustic signals in social communication of killer whales; the identification and description of group-specific vocal dialects; and interpretations of these dialects to yield insights into the historical social evolution of the populations. Since 2001, his studies have broadened to include assessment of the conservation status of marine mammals and turtles off the pacific coast that are listed under Canada’s Species-at-Risk Act. Both the Government of Canada and the Province of British Columbia are currently engaged in resource development for economic gain that is proving tentative, at best. Two areas of focus include expansion in the oil and natural gas industries. It is the current goal of the BC Government to see liquified natural gas refinery development with both the Province and the Federal Government also considering pipeline expansion, the Northern Gateway pipeline, in partnership with Enbridge Corporation. Potential increases in oil-tanker traffic, should these projects proceed, is on the minds of many British Columbians. Other environmental concerns include issues of species infiltration related to salmon farming, with issues now in debate, relative to the impacts of salmon-farming of non-native species on wild salmon stocks in the region. Environmental groups and others are opposed to resource development projects due to the negative environmental impact such expansion will have on many fronts. The maintenance of the pristine natural habitat, for many wildlife species, including killer whales and other marine mammals, is of utmost concern for the people of the Province of British Columbia; with the prominent voice of concern coming from various environmental groups and First Nations peoples. The Governments of both Canada and in the Province of British Columbia, seem to rely heavily on the courts in making tough, environmental decisions, with cases often before the courts, due to forced action being undertaken by those concerned with the environment. An original court decision in 2009, filed against the Department of Fisheries and Oceans by Eco-Justice, found that the Government of Canada had not adequately protected the habitat of killer whales, specifically, the Northern and Southern resident populations, whose numbers are in decline. Although the Government of Canada appealed this decision, as they seem to do in all such cases, in February, 2012, the federal court of appeal in Canada, upheld the previous ruling; finding the Department of Fisheries and Oceans (DFO) had failed to legally protect critical killer whale habitat. This ruling led to a draft action plan for the Northern and Southern resident killer whales in Canada, released in March, 2014. 'The Action Plan for the Northern and Southern Resident Killer Whales in Canada'***, just released in March of this year, outlines activities to be undertaken by Fisheries and Oceans Canada, with respect to all recovery efforts for this population of Orcas in the pacific region. The plan is presented also to other jurisdictions, organizations and individuals having a role to play in the protection, interest and consideration of killer whales in the region.. Ensure that killer whales have an adequate and accessible food supply to ensure recovery. Ensure that chemical and biological pollutants do not prevent the recovery of resident killer whale populations. Ensure that disturbance from human activities does not prevent the recovery of resident killer whales. Protect critical habitat for resident killer whales and identify additional areas for critical habitat designation and protection. Although the impacts of the recovery measures in Canada's action plan are unknown, it is projected that the measures will ensure stronger survival rates and growth of this population of killer whales, and provide additional benefits to Canadians who enjoy these animals in the ocean environment. Additionally, it is anticipated that some research and threat mitigation activities will result in benefits to other marine mammals and sea turtles, including a number of SARA (Species at Risk Act) listed species. Ensuring an adequate and accessible food supply is listed as the top priority for allowing recovery of the population of the species in these two resident groups. It's important to note, however, that the action plan is just that, a plan. The results of the legal process, although strong in condemning the Government of Canada's lack of action towards ensuring the protection of killer whale habitat, consideriing all the recent cuts to environmental, science programs and watchdog agencies in Government, it begs the question: "Will the Government of Canada follow-through with their court ordered committments?" It is estimated that, even under the best scenarios, recovery of numbers in these two populations will likely take up to twenty-five years. 1. The draft Action Plan for the Northern and Southern Resident Killer Whales (Orcinus orca) in Canada, is available at the Fisheries and Oceans Canada website: http://www.pac.dfo-mpo.gc.ca/consultation/sara-lep/rkw-epres/docs/rkwap-paepres-2014-03-draft-ebauche-eng.pdf. B.C. Conservation Framework. 2014. Conservation Framework Summary: Orcinus orca pop. 5. B.C. Minist. of Environment. Available: http://a100.gov.bc.ca/pub/eswp/ (accessed Jul 9, 2014). Committee on the Status of Endangered Wildlife in Canada: Wikipedia: Under the Creative Commons Attribution-Share Alike License: 2014. Wikimedia Foundation, Inc. a non-profit organization. ***Fisheries and Oceans Canada: 2014: Action Plan for the Northern and Southern Resident Killer Whales (Orcinus orca) in Canada [Draft]; Species at Risk Act Action Plan Series. Fisheries and Oceans Canada, Ottawa. Holly Fearnbach, John W. Durban, Dave K. Ellifrit, Ken C. Balcomb: Size and Long-term Growth Trends of Endangered Fish-eating Killer Whales: School of Biology, University of Aberdeen, Lighthouse Field Station, Cromarty, Ross-shire IV11 8YJ, UK2: Center for Whale Research, Friday Harbor, Washington 98250, USA : Protected Resources Division, Southwest Fisheries Science Center, National Marine Fisheries Service, National Oceanic and Atmospheric Administration, 8604 La Jolla Shores Drive, La Jolla, California 92037, USA..
**John K. B. Ford, Graeme M. Ellis, Peter F. Olesiuk and Kenneth C. Balcomb: Linking Killer Whale Survival and Prey Abundance: Food Limitation in the Oceans' Apex Predator? : Fisheries and Oceans Canada, Paciﬁc Biological Station, 3190 Hammond Bay Road, Nanaimo, British Columbia,Canada V9T 6N7; Center for Whale Research, 355 Smugglers Cove, Friday Harbor, WA 98250, USA ; Author for correspondence (john.k.ford@dfo-mpo.gc.ca). Taylor, B.L., Baird, R., Barlow, J., Dawson, S.M., Ford, J., Mead, J.G., Notarbartolo di Sciara, G., Wade, P. & Pitman, R.L. 2013. Orcinus orca. In: IUCN 2013. IUCN Red List of Threatened Species. Version 2013.2. (http://www.iucnredlist.org) Downloaded: 15 March 2014.